1953 Met Jasper Johns who became a great influence to his work. The two artists shared neighboring studios. 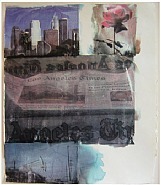 1984 Began "The Rauschenberg Overseas Culture Interchange"